The peculiarity of this Demolition "Mugatu" Spline Drive Sprocket - 24mm lies in its hole, which is equipped with 48 fine teeth and which can be inserted on a 24mm crank spindle with 48 splines. This new type of spline drive sprockets requires no sprocket bolts for fixing the sprocket on the crank arms and can be combined with 48 spline drive cranks which have no recordings for sprocket bolts. This Spline Drive technology offers the following advantages: The possibility of a precisely straight alignment of the chain, the possibility for a uniform alignment of the spacing of the crank arms to the lower rear end tubes, the usage of more stable and lighter crank arms without additional welded inserts for sprocket bolts and a overall cleaner look of the crankset. 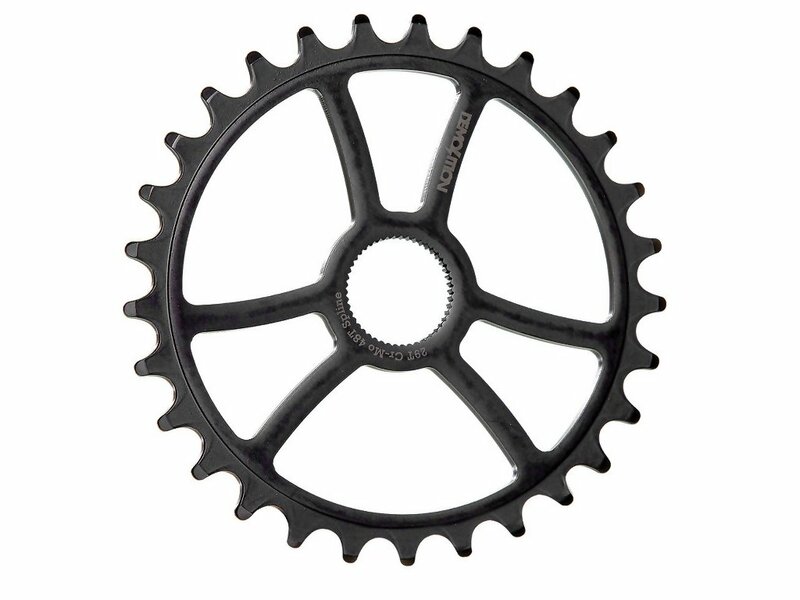 The use of heat treated 4130 CrMo material makes it possible for this Demolition "Mugatu" Spline Drive Sprocket - 24mm just to use a wall thickness of 5 mm and still produce a very stable, durable and lightweight sprocket which optically looks super chic with a classic 3-star design.